Statistics show that the city of Liverpool is steadily growing. So are it’s businesses. So is probably your company as well. And certain as taxes during the operation of any company comes a time when it has to deal with office relocation in Liverpool. It’s a very common situation when the old office has become too crowded and the company owner and/or manager has to take the sometimes difficult decision to move the office to a new business building. And if changing business location and the troubles that come with it are not enough (such as notifying customers, printing new business cards) the process of moving from one office to another is always a mild headache on its own. Moving a couple of laptops and the smiley face cup you drink coffee from is hardly a problem. But then moving big items like your company server or the big glass tables from the lobby is quite the challenge. This is why you need a company such as ours to provide you with a specific set of moving services. Handling big pieces of furniture or delicate tech equipment can be tricky, to say the least. It is strongly recommended you trust trained professionals to carry out moving everything from between the four walls of your old office to the new residence of your business. Moving to a new house on your own is difficult, moving to a new business office is practically impossible. Paying for professional moving services is not so much a matter of convenience as it’s a necessity. Trusting your expensive office equipment in the hand of highly trained professionals is in practice an investment, a shrewd business decision. Computers, water coolers, screens and projectors – our movers are prepared to transport any type of office equipment fast and safely so you don’t have to worry about breaking any piece of the office inventory whilst relocation. 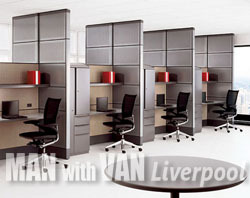 For your money you’ll get a high quality office moving service in Liverpool. All of your office inventory will be handled with care, well packaged and transported safely and fast. We understand how difficult a commercial relocation in Liverpool can be and we’ll put all of our effort in easing the process for you. With 24/7 phone and email customer support, highest quality equipment and vehicles, dedicated movers – we’re prepared to help you move your business from and to any place in the city of Liverpool, taking care of pick-up, packaging and transportation. We consider each order unique and plan each relocation individually and are prepared to offer custom pricing for your order depending on your needs and requirements concerning your office removal, arranging the service accordingly. No matter how big your business or how numerous your office items are our big team of top skill movers is prepared to to handle the relocation of your office with utmost care and professionalism. So call us now for your personalized moving plan.